Table top displays are not only just for exhibitions and trade fairs but can be used in reception or lobby areas of companies, at sales presentations, in fact, the list is endless. Tabletop displays are incredibly portable and versatile, allowing them to be suitable for a range of uses. These small-scale advertising tools or promotional exhibits are ideal to make a substantial visual impact and offer a professional marketing presence. The displays take up little room but convey your message. As a table top display is generally at eye level, it naturally gets the attention of the passer-by. These displays are good exhibit solutions in tight spaces. If you wish to transport your table top display to a venue, then these extremely portable displays are easy and lightweight to carry and take only a few minutes to assemble. A trendy curved display can look spectacular when assembled and the product images have been attached. You can choose to have a header board for that extra height offering a little more advertising space, and the use of lights above your display can enhance your display area. Why opt for a table top display? All of our desktop display boards come with a header panel included which are perfect for your company’s logo or organisation name. The table top display can also be used without the header panel depending on your needs. You are able to choose from a landscape/junior or portrait/senior orientation. Which is great when you have limited space available. Exhibition displays are often advertised as portable even though they can be quite difficult to carry and store. Our display boards however really are lightweight and therefore are easy to carry, store and transport. For example, our Junior Tabletop Display board weighs approx. 3.5kg. which is a lightweight solution that can be carried by one person. All of our tabletop displays can be assembled effortlessly. All of our display boards come with a FREE carry bag! This means that your display board will be protected during transport and storage and can easily be carried around between events. A popular choice when it comes to our tabletop displays is our PVC Senior tabletop display panel. It may be a good idea to have your company name on the header part of the display at the top to make the visitor or passer-by aware of who you are. They are also available in 13 different colours so you can coordinate your folding display boards with your branding colours or exhibition stand. These are held in stock and dispatched the same or next working day. Making them the perfect solution for a last minute event. A great benefit to our tabletop display boards is that you are able to keep your posters/graphics attached to the board even when the boards are folded and stored away. This allows for setting up at your next event to be much quicker, allowing for you to focus purely on your visitors. Our portrait alternative to the senior display board is the Junior landscape PVC tabletop display panel. Attaching your notices couldn't be easier. Simply velcro your display material on for a lasting display solution. If you require more of a robust solution, our Senior aluminium frame tabletop display board is an ideal alternative. This can also be purchased in the landscape version called our Junior aluminium frame table top display board. This includes a large centre panel fixed in landscape orientation with two smaller sides panels attached by hinges. 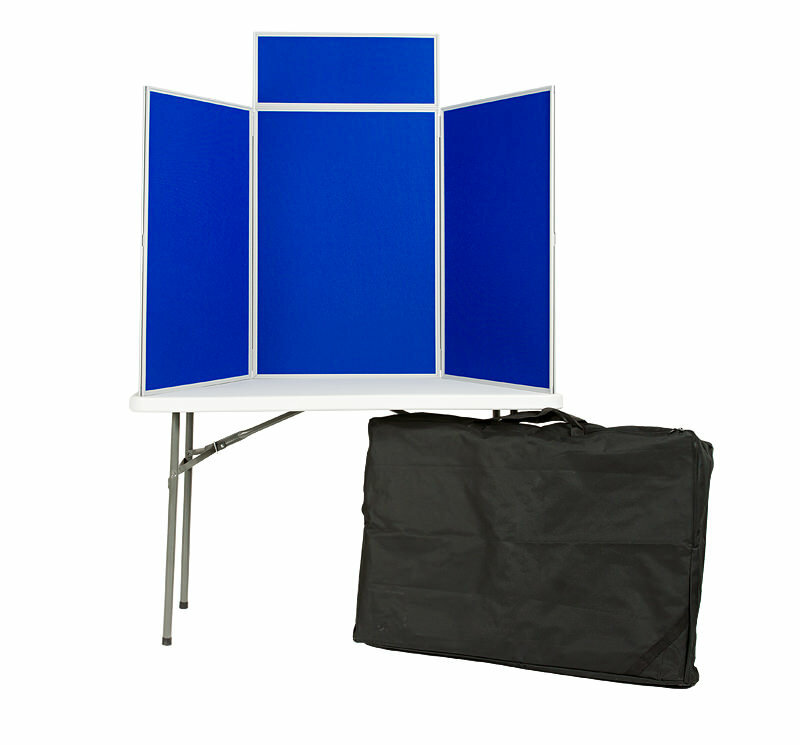 Supplied with a carry bag for free, these display boards can be transported effortlessly. Our aluminium framed tabletop display boards are suitable for velcro use. To give even more choice to our customers, we also offer Pinnable Display Boards. 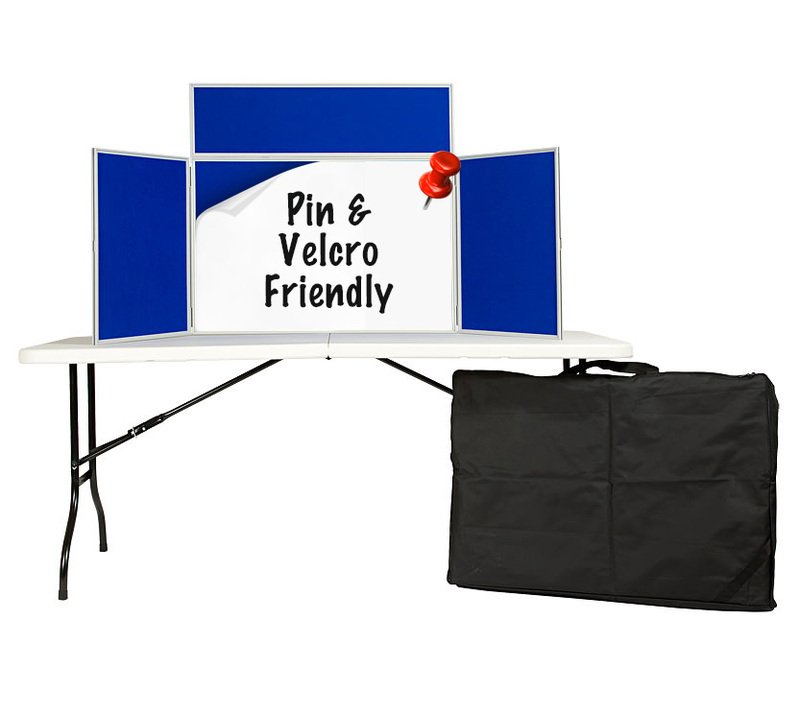 These table displays, in particular, are suitable for use with pins or Velcro. This is unlike the rest of our range which are suitable for velcro displays only. Each panel of these display boards are thicker than our standard boards so can be used with pins without causing damage. These pinnable display boards are available in a range of sizes and come in a choice of 13 luxury foam backed loop nylon fabric options. We do also stock a heavy duty display board, which again can be purchased in a landscape version called our junior heavy duty tabletop displayboard, or portrait orientation called our heavy duty senior tabletop display board. The gear edge hinge system in this display board is strong and robust which means it can be positioned at any angle. It is easy to transport and store but the sturdy frame means these folding boards are also suitable for a more permanent display. Allowing it to be ideal or reception areas and school. To complement your table top display you could consider using a printed table cloth with your logo to give that little extra panache. You are then ready to advertise and your table can hold your marketing literature or your product samples. A table top display is an extension of your marketing so it’s best to get it right. Keep table items tidy and ensure you have enough literature in your brochure stands. The more brochures or leaflets you give out, the more chance you stand of making a sale. You could perhaps ask your venue to provide you with a couple of chairs so that you are able to sit down with your potential customers and discuss your product or service and offer them a better understanding of your business. Due to space constraints, it’s a good idea to keep your wording brief but to the point and ensure the content is easily seen such as your company name, website address, telephone number and your product or service. Keep the display interesting and cheerful. For more information on our table top displays contact us or call us on 01733 511030.